These are the fundamental levels that artefacts can exist at, which sit between the fundamental phases of transformation. Starting at the Enterprise Context, the information at each level is transformed and becomes closer to the physical world. 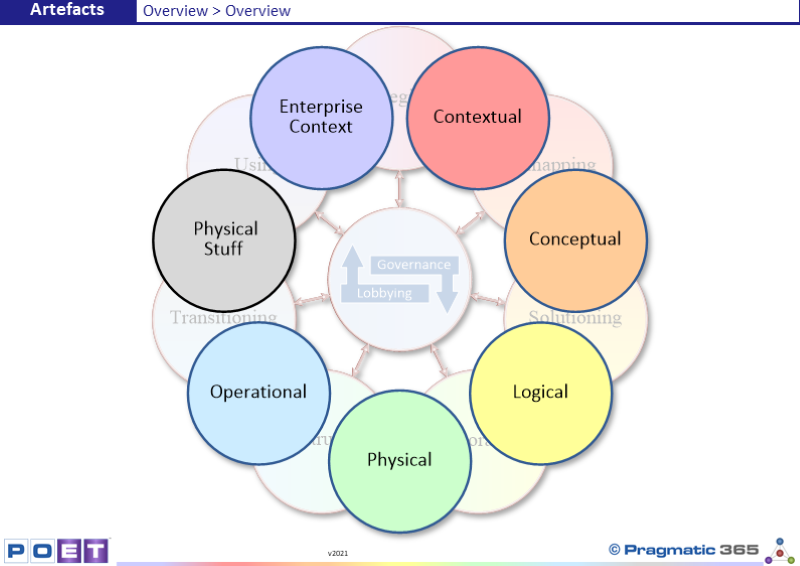 ¨ Enterprise Context - A representation of the physical world outside out Enterprise. ¨ Contextual - A representation of why we exist and how we satisfy the need for our existence? ¨ Conceptual - A representation of how we need to change. ¨ Logical - A representation of Logical Solution designs. ¨ Physical - A representation of Physical solution designs. ¨ Operational - A representation of the physical world. ¨ Physical Stuff - The physical world inside out Enterprise. Do you agree with these fundamental levels? What fundamental levels does your Enterprise define? If it does not, does that cause any problems or issues? If so, how will you solve them?